A calm, green village with deep roots, Ruza is one of the most attractive small towns in the Moscow region. The area to the west of Moscow is covered with a network of small towns that originated in the middle ages and have preserved their intimate scale despite the rapid expansion of the capital. One of the most pleasant is Ruza (population just over 13,000), dotted with parks and picturesquely situated above the Ruza River, a right tributary of the Moscow River. Some specialists derive the origins of the river’s name from a Baltic word for “calm,” or “peaceful”— both appropriate for the town’s appearance. Although questions linger about the year of its founding, the officially accepted date is 1328, when the settlement is mentioned in a testament of Moscow’s Prince Ivan I (Kalita). Naturally protected by a web of small rivers, Ruza was nonetheless vulnerable because of its proximity to invasion routes leading to Moscow. During the reign of Grand Prince Dmitry Donskoy (1350-1389) the settlement was taken as part of an attack on Moscow by Tatar Khan Tokhtamysh in 1382. This invasion was launched in response to Dmitry’s major victory over a Tatar army in 1380 at the Battle of Kulikovo. During the 15th century, Ruza was linked to various small principalities in Moscow’s orbit, and by the early 16th century the it was already directly absorbed into the Muscovite state. At that time Ruza was part of a chain of fortified towns along the western borders. Ruza’s defenses were severely tested in the early 17th century during a political collapse known as the Time of Troubles. Part civil war and part dynastic struggle, the era followed the death of Tsar Boris Godunov in 1605 and waned gradually only after the enthronement of Tsar Michael Romanov (1596-1645) in 1613. During this period, Russia was wracked with devastation caused by warring factions. As late as 1618, Ruza was besieged by Władysław (1595-1648), eldest son of King Sigismund III Vasa of Poland and heir to the Polish crown. The attack on Ruza was part of his ill-considered campaign in 1617-1618 to regain power in Moscow. Fortified by a log stockade and six log towers on a high earthen rampart, Ruza withstood all Polish assaults and thus contributed to the failure of Władysław's attempt to dethrone Michael Romanov. Ironically, the log fort burned the following year, but by that time it was no longer needed. To get to Ruza take a regular bus from Tushinskaya bus station, Moscow (departure every hour). The trip takes approximately 2 hours. As Russia expanded westward in the 17th and 18th centuries, Ruza lost its military significance and became a local administrative center. In 1784, it gained a regular street plan through Catherine the Great’s comprehensive effort to bring order to the design of provincial towns. Although a quiet backwater at the beginning of the 19th century, Ruza was again swept by cataclysmic events during the Napoleonic invasion. Following the epochal Battle of Borodino on Sept. 7, 1812, the Ruza area was taken by units of the IV Corps commanded by Napoleon’s stepson, Eugène de Beauharnais. Intent on pursuing Russian commander Marshal Mikhail Kutuzov’s forces toward Moscow, the French were instead harassed by local resistance (including some 2,000 peasants armed with pikes) that limited their maneuverability and ultimately led them to abandon Ruza. Built overwhelmingly of wood until the Soviet period, Ruza during the 18th and 19th centuries saw the construction of masonry churches that formed the town’s visual dominants. The oldest of these is the Cathedral of the Resurrection, originally constructed in 1714-1721 and substantially rebuilt during the 19th century. Desecrated during the Soviet period, the structure has undergone a major reconstruction as the town’s main church. A few blocks from the central square is the Church of the Intercession, completed in 1781 in a transitional style from baroque to neoclassical. Its monumental bell tower stood separately until the construction of a refectory in the early 19th century. Near the Intercession Church is the Leontiev house, a good example of the “wooden moderne” style from the early 20th century. The log structure was crafted by Finnish carpenters in Vyborg and then transported to Ruza. In terms of design, the most idiosyncratic structure in Ruza is the Church of St. Dmitry, completed in 1792 near the cemetery across the small Gorodenka River on the west side of town. Its form consists of a cruciform core with rusticated bays inserted on the diagonals. The effect on the interior is something like an octagonal tower, but with unequal sides. A refectory and bell tower added in 1848 increased the space, but obscured the dynamic form. By the end of the 19th century, Ruza had a modest commercial district extending from the cathedral toward the Intercession Church. In the early 20th century, much progress was made in education, social welfare and beautification of the town, including a large park. This amelioration led to the Ruza’s designation in the 1930s as part of a projected “green rest zone” for greater Moscow. These hopes were interrupted by the outbreak of war. During the Battle of Moscow in Fall 1941, Ruza was occupied by German forces on Oct. 25. Following the Soviet victory at Moscow, a Soviet counteroffensive approached the outskirts of the town in late December. The Germans in the meantime had converted the Ruza River into a heavily defended barrier, and the town was not cleared of the enemy until Jan. 19, 1942. Ruza was severely damaged not only by the fighting but also by widespread pillaging over almost three months of occupation. Partisan activity focused on intelligence gathering, but there were also efforts to destroy German shelter in the area. One such attempt at the nearby village of Petrishchevo led to the capture, torture and execution of the 18-year old Zoya Kosmodemyanskaya. After the first accounts in late January of her heroic resistance, she became a national martyr and the first woman to receive the title (posthumously) of Hero of the Soviet Union. The main memorial to local sacrifices during the war is situated in a park square near the Resurrection Cathedral. Rebuilt by 1947, Ruza benefited in subsequent decades from thoughtful stewardship that has made its park-like setting into one of the most attractive small towns in the Moscow area. Although not served by the suburban rail network, Ruza is readily accessible by car or bus from Moscow or nearby Mozhaisk. 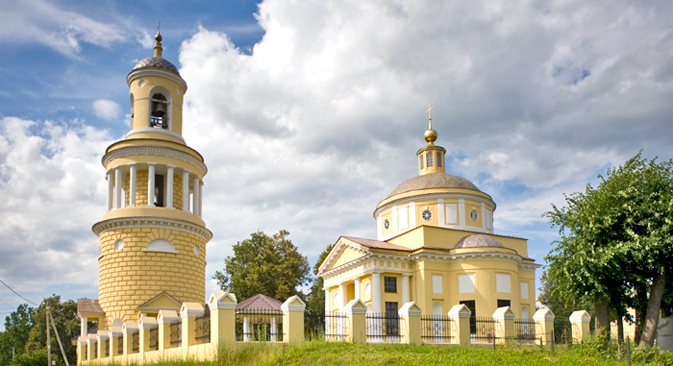 Some 10 km north of Ruza is the estate ensemble at Nikolskoe-Gagarino, a grand monument to the Age of Catherine the Great. Built in 1774-84 to a design by Ivan Starov, one of the leading masters of Russian neoclassicism, the estate belonged to Prince Sergei S. Gagarin (1745-98). The manor house and park are not open to the public, but the Church of St. Nicholas and its monumental bell tower (blown up during fighting in the fall of 1941) have been splendidly restored and are beautifully visible from the main road.